To celebrate their 100th year in business, Mossberg is releasing a new pistol, only their second in the company’s history. Don’t feel bad if you are unfamiliar with the shotgun powerhouse’s first foray into handguns. The Mossberg Brownie was the company’s very first firearm – a four-barreled .22 caliber pistol marketed toward hunters and trappers – was only produced from 1919 to 1932, during which it sold for a mere $5. The prodigal pistol producer’s latest handgun, dubbed the Mossberg Carry 1 Sub-Compact (MC1sc), is more on-point for one of the hottest market segments today: the sub-compact single stack 9mm carry gun. The GunLink team went hands-on with the MC1sc at SHOT Show 2019, including getting some trigger time with the new pistol during Industry Day at the Range the day before the show officially opened. My first thought when Mossberg announced the new handgun was that they were late to an already crowded party. A party already attended by a pretty popular in-crowd, including the Glock 43, Smith & Wesson Shield, Springfield XDs, and the newer Sig Sauer P365. Stiff competition for a company with a sparse track record in the handgun arena. Good luck, Mossberg. In the desert nearly an hour outside of Las Vegas, the cool air is filled with the smell of diesel exhaust and the sound of gunfire. Lots of gunfire. Like, really… a LOT of gunfire. It isn’t some wild west shootout and, although there will be pistols at noon, they’ll be rattling off shots all day – along with rifles, shotguns, machine guns, and a whole lot more. Welcome to the 2019 SHOT Show Industry Day at the Range. As they do every year on the day before the NSSF Shooting, Hunting, and Outdoor Trades Show – the industry’s annual B2B expo – oficially opens its doors, nearly 200 vendors and exhibitors meet at shooting range in Boulder City to host invited media and industry buyers. 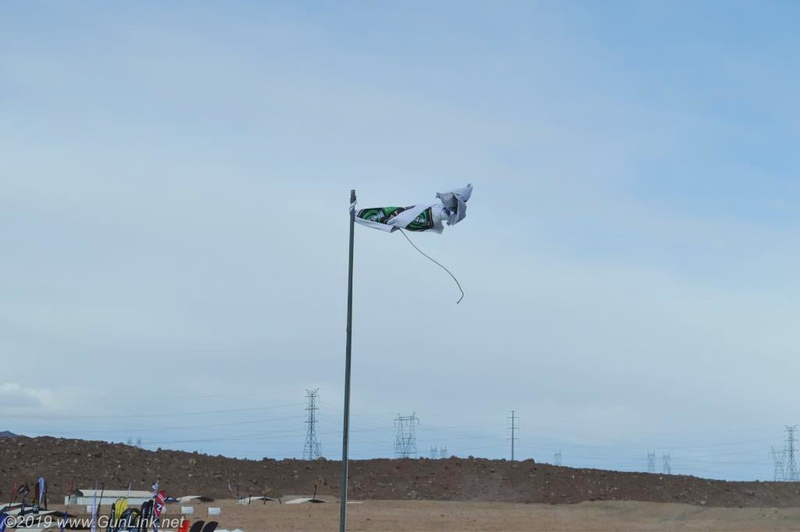 Those in attendance braved the biting wind, easily 15mph all day long, to see industry leaders showcase the latest and greatest hardware that their companies have to offer. Not just to see new guns – but also to shoot them. Given the political climate several years ago, it seemed as if a lot of firearms R&D had slowed down – perhaps for fear of increased regulation. The relentless attack on 2A rights has not let up in the latest election cycles and, when we saw that a couple familiar names were absent at Range Day, we worried that, instead of innovation, we might just find new lipstick on old pigs. While there was some of that – the same firearm lines with addition of new calibers or colors – we were treated to a few interesting items. FN America, LLC is pleased to announce the release of the FN 509® Midsize, a new carry option in the FN 509 series of striker-fired pistols. Additionally, the FN 509 Tactical is now available in a matte black finish. 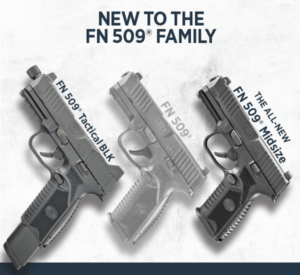 These line extensions further FN’s commitment to offering a full line of options in the FN 509 series that meets all customer expectations. The new FN 509 Midsize pistol is chambered in 9mm and features a four-inch slide and barrel, frame with shortened grip and 15- or 10-round magazine capacity, backward compatibility to higher capacity FN 509 magazines with use of a grip sleeve and fixed three-dot luminescent sights. From individuals seeking a do-it-all range, home defense and carry pistol to law enforcement use as a backup duty pistol or carry model for plainclothes officers, the FN 509 Midsize is the ideal solution. The pistol also features various upgrades including new sculpting around the magazine release for easier activation, a flatter-faced trigger for a more controlled trigger press and improved slide stop lever and texturing. FN 509 Midsize MSRP $649. The FN 509 Tactical, the industry’s leading optics-ready 9mm striker-fired pistol, is now available in a matte black finish. The pistol features the company’s patent-pending Low-Profile Optics Mounting System™ that enables the platform to accept more than ten commercially-available miniature red dot (MRD) optics that co-witness with the suppressor-height night sights and remain adaptable to future optics releases with no requirement of direct milling of the slide. The slide cap, for use when not shooting with an optic, has raised sight wings that protect iron sight alignment if the pistol is dropped or jostled, and provides a textured ramp for racking the slide against a belt loop, pant pocket or boot. An FN-signature 4.5-inch, cold hammer-forged, stainless-steel barrel with target crown, ½” x 28 threads that accept the bulk of 9mm suppressors available and thread cap with integrated O-ring to prevent loosening during use. Lastly, the 24-round magazines, nearly identical in length to the pistol’s slide, maximize ammunition capacity without impacting carry convenience. FN 509 Tactical Black MSRP $1049. These two new pistol offerings are available for purchase today through FN-authorized retailers and will be on display at the company’s 2019 SHOT Show® Booth, #13662, in Las Vegas, Nevada, Jan. 22-25, 2019. In celebration of the company’s 100th Anniversary, O.F. Mossberg & Sons, Inc., is announcing the release of a full-featured, 9mm concealed carry handgun: the Mossberg MC1sc (subcompact). Coming full circle from the company’s first firearm design, called the Brownie, a 22 caliber, four-shot “pocket pistol,” Mossberg has incorporated 100 years of engineering expertise in developing this superb concealed carry handgun. 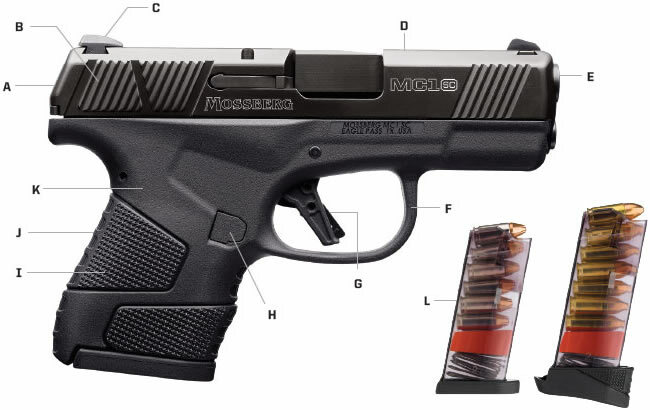 The MC1sc is available in five initial 9mm offerings: the standard MC1sc and an optional cross-bolt safety version; two standard offerings with sighting systems, choose from TRUGLO Tritium Pro Night Sights or a Viridian E-Series Red Laser; and a Centennial Limited Edition with a production run limited to 1,000 commemorative models. After 100 years in business, Mossberg has grown to be the 6th largest U.S. firearms manufacturer, and remains dedicated to innovation, with over 100 design and utility patents to its credit. The MC1sc reflects three years of development and new patent-pending ideas in combining the most highly-desired features in the subcompact market with Mossberg’s innovative approach to design. Important features in a subcompact handgun are size, weight, caliber and carryability; and the MC1sc delivers with its overall length of 6.45 inches; recoil-managing weight of 19 ounces (with empty magazine); and barrel length of 3.4 inches in the popular 9mm chambering. Other desired features include two single- stack magazines, a flush 6-round and 7-round extended; glass-reinforced polymer frame; and suggested retail price of $421 for the two standard models. Several weeks after an online “leak” began creating buzz about the two new single-stack 9mm Glock pistols, the company officially announced the new additions today. 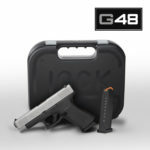 The rumor mill kicked off with word of the G43X, complete with rendered photos of what the new pistol – a G43’s 3.4″ barrel and 6″ slide atop a .75″ longer grip – would look like. This longer grip gives it a magazine capacity bump of four rounds from six to 10. As several totally-organic posters on social media pointed out that the “X” designation meant that it was crossed something, news of the G48 spread. This latest offering has a nearly identical footprint as the G19 but shaves off a tremendous 0.16″ at a loss of 5 rounds, matching the 43X’s 10 round capacity. The GLOCK 43X and the GLOCK 48 feature the design of the Slimline series with a silver slide and are a perfect fit for everyday carry. Chambered in 9x19mm, both pistols feature a compact Slimline frame with silver nPVD finish. 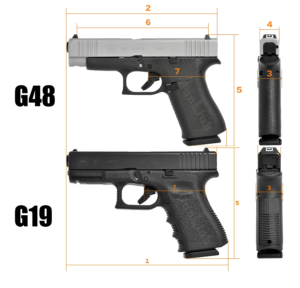 Designed for comfort, the G43X and G48 combine a longer grip length with a minimal width around 1” for what the company describes as “a comfortably balanced, versatile grip that’s ideal for a variety of users.” While the two pistols share the same size frame, they have different slide lengths. 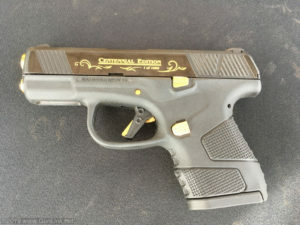 These pistols incorporate elements of the Slimline series such as the short trigger distance, a frame with a built-in beavertail, a reversible magazine catch and the match-grade GLOCK Marksman Barrel (GMB). 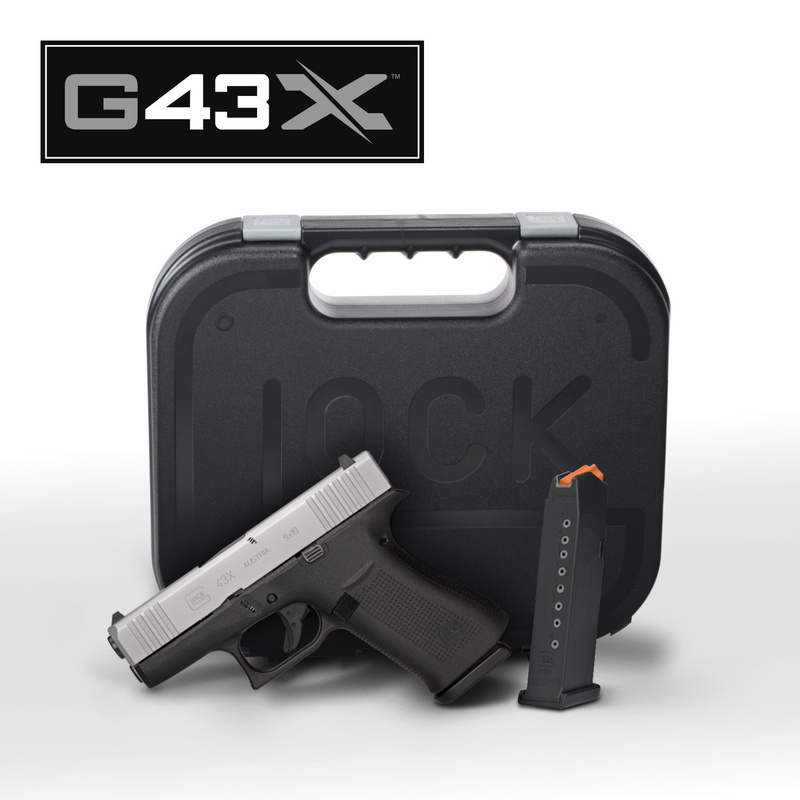 The G43X and G48 also feature precision-milled front serrations. Both models are available in three sight configurations; standard, GLOCK Night Sights (GNS), and our personal favorite, Ameriglo BOLD. The silver Slimline models G43X and G48 will be showcased at SHOT Show 2019 and will be available on dealer shelves beginning January 21st. The GunLink team will be sure to get some hands-on range time with the new pistols and share our experiences here and in the GunLink Forums SHOT Show board. 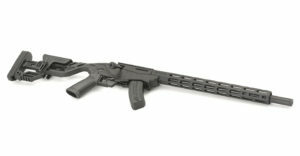 Sturm, Ruger & Company, Inc. (NYSE-RGR) proudly introduces magnum models of the Ruger Precision Rimfire rifle and a new BX-15 Magnum magazine. Faster, flatter and with high-performing bullets, .17 HMR and .22 WMR cartridges expand the capabilities of the Ruger Precision Rimfire platform. Like its .22 LR predecessor, these new magnum offerings maintain the same ergonomics, trigger and manual of arms as the larger centerfire Ruger Precision Rifle. The Ruger Precision Rimfire’s molded, one-piece chassis and adjustable buttstock assembly are manufactured from strong glass-filled nylon, offering a solid foundation for accuracy. The innovative Quick-Fit Precision Rimfire stock allows the rifle’s length of pull and comb height to be quickly and easily adjusted for proper fit over a wide range of shooter sizes, outerwear and shooting positions.